These days when you visit the Baja peninsula and the Gulf of California things can seem slow, lazy, sometimes as if not even time is moving. It is the moment, it is Zen, it is calm. This is not how things started. 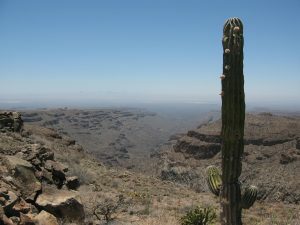 Baja and the Gulf of California were born from crashing tectonic plates, erupting volcanoes and the violence of geology. They were created quickly, in the blink of an eye, and not very long ago. Geologically speaking. Now it may seem to our human mindset that this all took place an exceedingly long time ago. But to understand just how young the Baja peninsula really is, consider that those who know how to calculate such things say that Earth is 4.54 billion years old, give or take 50 million years. That is to say, most of the action that formed the land of the Baja peninsula took place in the period of time that correlates to a margin of error for the formation of Earth. And we’ve only gotten to the granite and the mountains. What is now the Baja peninsula was still firmly attached to mainland Mexico, and the Gulf of California was not even a twinkle in the Pacific Ocean’s eye. Which means that, at this point in our story, the Baja peninsula is still stubbornly connected to the mainland. But we’re getting to the good part now! “Then, 12 million years ago, the conveyor belt of subduction stopped” say Scott. Plates stopped colliding and the volcanoes slowly waned. There was calm. But then, thanks to a complex reorganization of tectonic plate motions, a new phenomenon emerged: oblique rifting. The plates began pulling apart, but at an oblique angle. Scott continues. “This oblique rift is called the Gulf of California Shear Zone. It became connected with the southern end of the San Andreas fault near the Salton Sea, which now made its way to Mexico. This resulted in right lateral fault motion in northwestern Mexico, and everything to the west of it began ripping away from the mainland, moving to the northwest, including the sliver of California that is to the west of the San Andreas fault – San Diego, Los Angeles, Big Sur, Santa Cruz. The area that is now San Jose del Cabo wrenched away from the area that is now Puerta Vallarta, and the formation of the Baja peninsula was in motion.” At last! The rest of it didn’t take long. By 8 million years ago the rate of ripping (oblique rifting) increased and the Gulf of California seaway (finally!) started to form, with the waters of the Pacific Ocean trickling up to somewhere around La Paz. By 7 million years ago the Gulf of California seaway had trickled up to Guayamas, and by 6.3 million years ago the gulf waters had gone all the way up to the Salton Sea region, forming an extremely long and skinny Gulf of California seaway from Cabo to southern California that was probably no more than 10 to 50 kilometers wide and well over 1,000 kilometers long. Of course, no current map shows the Gulf of California connected to the Salton Sea, and for that we can thank the Colorado River. About 5.5 million years ago it started flowing into the low-lying areas at the northern end of the Gulf of California (which was rapidly rifting apart) and forming large tectonic valleys that are similar to Death Valley today. The Colorado brought with it an enormous amount of sand and silt that essentially filled up the tectonic valleys across the entire area from the Salton Sea to the current Gulf of California, forming an agricultural river delta between Mexicali and Yuma. When you look at Google Map imagery of the Gulf of California today, you can clearly see the smooth, sandy bottom that characterizes the seafloor in the northern part of the gulf where the Colorado River deposited sand and silt, in contrast to the jagged and faulted continental remnants that characterize the seafloor in the central and southern Gulf, from about Bahia Los Angeles on down. The whole story is written right there on the seabed. Baja’s journey will continue. Along with the southern parts of the US state of California that are to the west of the San Andreas fault, Baja will continue to travel roughly 50 kilometers every million years, eventually sliding past Vancouver and Juneau and colliding with Anchorage in 50 million years or so. Which, remember, is just the margin of error for the age of Earth. We are practically there.